Phase I for a weapon against stationary targets, using GPS-aided inertial guidance (like JDAM (Joint Direct Attack Munition)). Phase II (a.k.a. SDB II or "SDB Increment II") for the addition of a terminal seeker for engagement of moving targets. In May 2002, the USAF deferred Phase II, and the competitors were told to stop all work unique to this part of the program. Boeing's GBU-39/B first flew in February 2003, and in October that year, Boeing was declared winner of the SDB Phase I competition. The following SDD (System Development & Demonstration) phase ran until August 2005, and in April that year Boeing received the first LRIP (Low-Rate Initial Production) contract for the GBU-39/B. In 2006, the weapon underwent operational testing, and IOC (Initial Operational Capability) on the F-15E was declared in October that year. The first full-rate production contract (for 1600 SDBs) was awarded in December 2006, and at the time of this writing a total production run of 24000 GBU-39/B rounds is planned. The GBU-39/B uses a multi-purpose warhead for penetration and blast/fragmentation effects, and is guided by a GPS-enhanced inertial navigation system. The GPS unit is equipped with the latest SAASM/AJ (Selective Availability Anti-Spoofing Module / Anti-Jam) technology. The SDB uses flip-out diamond wings to achieve a stand-off range of more than 110 km (60 nm) for high-altitude drops. Boeing also developed the new BRU-61/A bomb rack, which carries four GBU-39/B bombs. The BRU-61/A is mandatory for SDB carriage, and can be employed externally (e.g. F-15E, F-16) or in internal weapons bays (e.g. F-22, F-35, B-2). Although the SDB is significantly smaller than existing bombs, its warhead is still adequate for many typical targets. E.g. its steel and concrete penetration capability is similar to that of the much larger 2000 lb BLU-109/B warhead. Therefore the SDB enables USAF bombers to attack more targets per sortie. The smaller warhead will also tend to reduce collateral damage. The GBU-39A/B FLM (Focused Lethality Munition) variant uses an improved warhead which further reduces collateral damage. In April 2006, two competitive SDB II risk reduction contracts were awarded to Boeing and Raytheon. 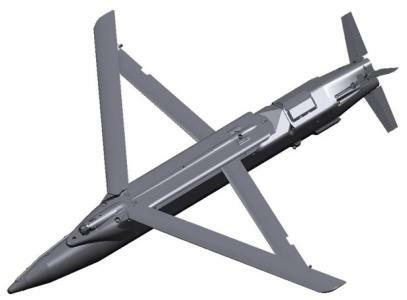 Boeing has teamed with Lockheed Martin, which will provide the seeker for Boeing's GBU-40/B SDB II. Raytheon's SDB II entry has been designated as GBU-53/B. SDB II's main improvements over the GBU-39/B will be a multi-mode terminal seeker with autonomous target recognition capabilities, and a two-way datalink. The announcement of the winner of the SDB II competition is scheduled for late 2009.